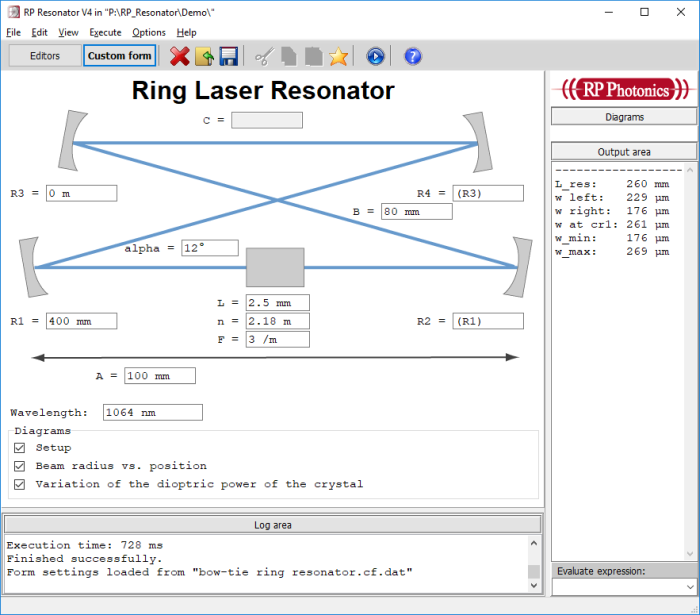 Abstract: In the software products RP Resonator for laser resonator design and RP Coating for thin-film optics, it is now possible to define so-called custom forms - forms which can be tailored to specific applications by the users or within the technical support. That feature has previously been introduced for the RP Fiber Power software. In the newsletter of 2015-04-29, I have reported on the feature of so-called custom forms in the software RP Fiber Power. Today I can tell you that this useful feature has now also been integrated into the software RP Resonator and RP Coating. For both of them, a new version has come out which we call V3; existing customers can buy a cheap upgrade. The basic idea behind custom forms is that these can be defined within scripts. Therefore, such forms can be generated by any user, not having access to the source code of our software. So you can make forms which are tailored to specific applications. This is particularly useful when you often need to do some calculations with different numerical values. You can then enter the input parameters into the custom form and also get results there, apart from graphical diagrams. 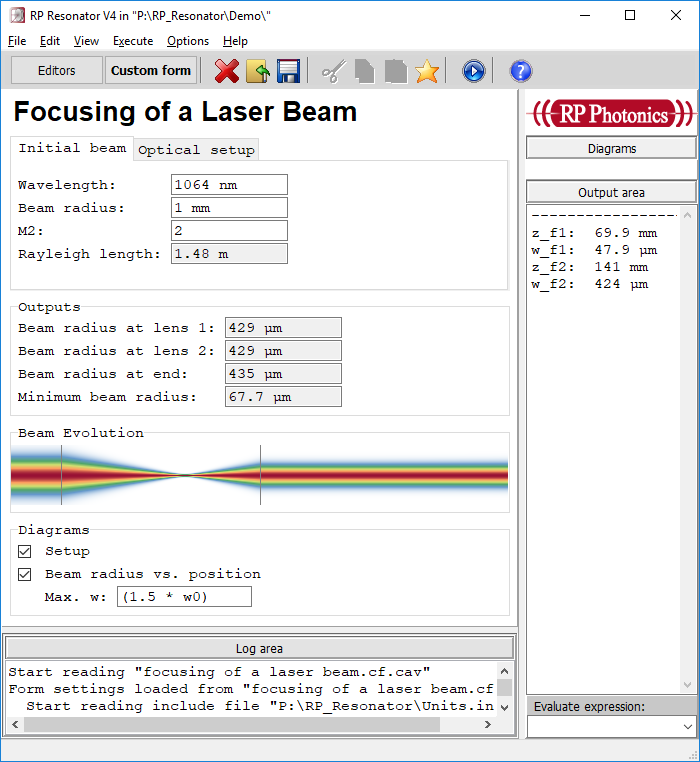 There, you can simply enter the initial beam parameters, the focal lengths of the two lenses and their positions, and the software calculates the evolution of beam radius. It can even display the beam graphically, using the nice feature that images can be displayed where the color of each pixel is determined by a mathematical expression – in this case, using the Gaussian intensity profile with a z-dependent value of the beam radius. 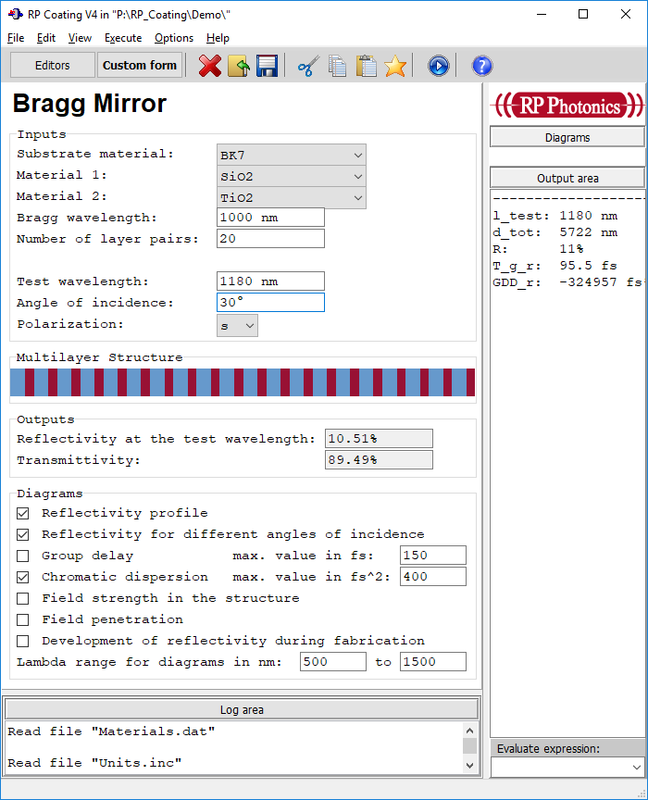 Finally, I present an example for the software RP Coating, concerning the design of Bragg mirrors. Here, you can choose two optical materials and enter parameters like the Bragg wavelength and number of layer pairs. You can produce different diagrams, for example showing the reflectivity profile for different angles of incidence. As you can easily imagine, it is more convenient just to enter some input parameters in a form, rather than changing them within a script (a text file). Making such a form is relatively easy and usually does not take too much time. Note that one person in an institution may play the role of the “guru”, making nice forms for use by all of his colleagues. Another possibility is, of course, to get such forms made within the technical support. So in principle the software can be used even by people who do not deal themselves with the technical details.